I recently attended an Avett Brothers concert that included Old Crow Medicine Show as the opening act. Both bands were full of frenetic energy and incredible musicianship. Old Crow is one of those bands that for me is much better in live performance where they can move beyond the constraints of a four minute song. They are a great jam band. And its clear they have fun making music. It’s infectious. Same thing, clearly, could be said of the Avett Brothers. But here’s a big difference. Old Crow’s lyrics were dominated by drugs, drinking, and loose women. In Old Crow songs, the world ultimately exists for their pleasure. Now, I get it that this may be a band persona, or that they might be representing a category of music that has hard living as its theme. But after awhile, their songs made me feel old and responsible. 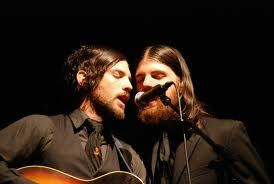 In contrast, the Avett Brothers sing songs of taking responsibility for their actions. While their more youthful days might be checkered with wilder living, their songs are about being men in a different way than Old Crow’s. In fact, big roars went up from the audience whenever a getting stoned reference was clear. In the same way, the crowd went nuts with the Avett Brothers only reference to getting high. But here the joke was on the audience. As the song told the story, when the drugs came out, that was the time to move on, to say I’m about something else. The Avett Brothers have seen the options and have at this point in their life chosen being adults. And they make it look fun. I love this! Big fan of Avett Brothers’ music because of the lyrics, energy and sound. Really great thoughts on what is so compelling about their work! You may be sounding ‘more old’ Mark, but you’re also sounding more like Jesus! He looked at EVERYTHING theologically and related everything to his Father’s world view. He couldn’t talk about a sparrow or a flower or a fox or a blade of grass without relating it to his world view in some way. I really enjoyed this piece, almost as much as your series on Missional leadership. Thank you. And remember, play responsibly! Scott and Seth are great and I mean great song writers. We have taken the whole family to their concerts and will again this NYE in Raleigh. Hard to find another band today that you feel comfortable letting your children attend their shows and listen to their music much less encourage it. My 9 yr old attended her first concert at 7 and loves them. Nice article. Thanks.